Port Hueneme (119.209W 34.153N) is located in southern California northwest of Los Angeles. The town was founded as Hueneme in 1872 but changed its name to Port Hueneme when construction of the port commenced 1939. The port was opened on 7 July 1940 and remains the only deep water port between Los Angeles and San Francisco. The port location took advantage of the presence of the underwater Hueneme Canyon, which brought a natural deep channel within 300 feet of the shore; an underground river that reaches the coast at this point and would help keep the channel clear of silt; and the offshore Channel Islands, which provided a natural breakwater. 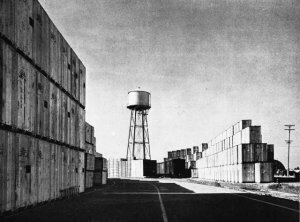 The Navy took over the port on 5 March 1942 as an Advanced Base Depot to supplement the depot at Oakland, which was inadequate for the projected need. The location of the port, away from the major shipping ports, was also considered advantageous. It was rapidly expanded to an area of 600 acres (447 hectares) with six docks with a capacity for nine ships and ramps for loading LSTs. The port had warehouse space of 719,000 square feet (66,800 m2) and another 19,000,000 square feet (1,800,000 m2) of open storage space. The Seabees established their main West Coast depot nearby, and there was also an amphibious landing training school. The harbor was handling 150,000 tons of cargo per month when the war ended, having peaked at 225,000 tons in June 1945.